Information about future releases is subject to change. Subscribe to my free newsletter for updates. General introduction to the issue. 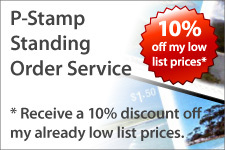 Who's on the stamp etc., related issues etc. 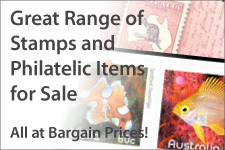 All images on this page come from the electronic version of the Stamp Bulletin. Actual images of the products will be posted when available. General description of issue - anything new, interesting or unusual. This issue was produced in small sheets of 10 stamps (5 x 2). Apologies for the quality of the image below. When a better image is available it will be posted. Although not rouletted, the booklets could be folded in half without damage to the stamps. On the back of each booklet is the 'Celebrating 200 years' logo. Booklets were distributed to post offices in chequebooks of 20 booklets. These are not listed on this website. The table below summarises the above information. The cost of each item is given, along with a total for each section. In some cases the stamps are only available from self-adhesive booklets (sold at face value), or from prestige booklets, souvenir sheets or folders (sold above face value). If you have more information, or spot an error, please e-mail me. Unless otherwise indicated, the content of this website is © 2009-2012 Christopher de Haer. Last updated 9 January 2012. 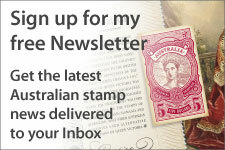 Website comments and queries to stamps@chrisdehaer.com.au or PO Box 1448, Booragoon WA 6954.